Richard Truly, Vice Admiral, U.S. Navy (Ret.) and former astronaut and NASA Administrator, is also a former Director of the Department of Energy’s National Renewable Energy Laboratory (NREL). Prior to joining NREL, he was Vice President of the Georgia Institute of Technology, and Director of the Georgia Tech Research Institute. He was the first commander of Naval Space Command. Truly served as NASA’s eighth Administrator under President George H. W. Bush from 1989-92, and his career in aviation and space programs of the U.S. Navy and NASA spanned 35 years. He retired as a Vice Admiral after a Navy career of more than 30 years. As a naval aviator, experimental test pilot, and astronaut, he logged over 7,500 hours and made over 300 carrier- arrested landings, day and night. His astronaut career included service in the USAF Manned Orbiting Laboratory program, and NASA’s Apollo, Skylab, Apollo-Soyuz and Space Shuttle programs. He was pilot aboard Enterprise during the Shuttle Approach and Landing Test program, and aboard Columbia, the first shuttle to be re-flown into space, establishing a world circular orbit altitude record. He commanded Challenger in the first night launch/landing mission of the Space Shuttle program. In 1986, he led the accident investigation of the Challenger accident, and the Shuttle return to flight. President Reagan awarded the Presidential Citizen’s Medal to Admiral Truly in 1989. 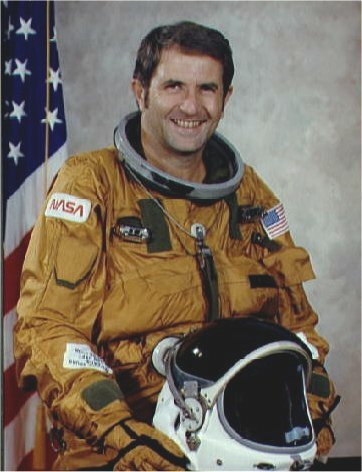 His NASA awards include two Distinguished Service Medals, the Outstanding Leadership Medal, the Exceptional Service Medal, and two Space Flight Medals. His military decorations include the Defense Distinguished and Superior Service Medals, two Legions of Merit and the Navy Distinguished Flying Cross. Active in national and community affairs, he has served on the Board of Visitors to the U.S. Naval Academy, the Defense Policy Board and the Army Science Board. He is a Trustee of Regis University and the Colorado School of Mines, and a member of the National Academy of Engineering. He is a director of Tetra Tech, Inc., Edenspace Systems Corporation and Suntricity Cells, Inc., and a former director of Xcel Energy, Inc. He is a native of Fayette, Mississippi. He and his wife, Colleen (Cody), have three children, five grandchildren and four great-grandchildren. He was inducted into the U.S. Astronaut Hall of Fame on November 10, 2001.